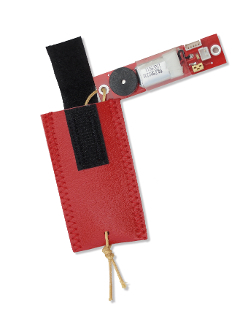 This vinyl protective pouch was designed for the Perfectflite series of altimeters (Strologger, Pnut etc) though other altimeters may also fit. Just contact us for other brands.This pouch securely holds your altimeter inside the pouch during use and protects it against ejection charge gasses. You might notice a slight buildup of ejection charge residue on your altimeter display during normal use. If you use cellulose 'dog barf' insulation for protection then your altimeter is likely to get dusty. This pouch is designed to prevent buildup of these materials on your altimeter. It can be cleaned simply by wiping with clean water in case you get any dirt or mud on it from your rocket's landing. This pouch comes with a piece of Kevlar cord that gets routed through the pouch and also through the tether attachment point on your altimeter. This provides a very secure attachment of the altimeter to your recovery system. Once attached, the altimeter can be slid out of the pouch for operation while still being attached to your shock cord or nose cone.